National Insect Week happens once every two years - and this is one of those years. So here's a little nudge to watch out for insects around you - maybe to post about them? The first was a bit of a disaster. You know how I said I was sitting in a friend's garden when, instead of politely drinking tea I leapt up and started taking photographs instead? Well, while I was looking at leaves the sun had chosen to spotlight, I noticed a hoverfly on a leaf. It wasn't moving. It was just sitting there. Ridiculously, I was worried about it straight away. Was it ill? Hungry? Dying? I say 'ridiculously' because I'm not above sliding my fingers along a stem to rid it of aphids, or clapping my hands together to kill a gnat if it flies into my house. So why did I bother about this hoverfly? 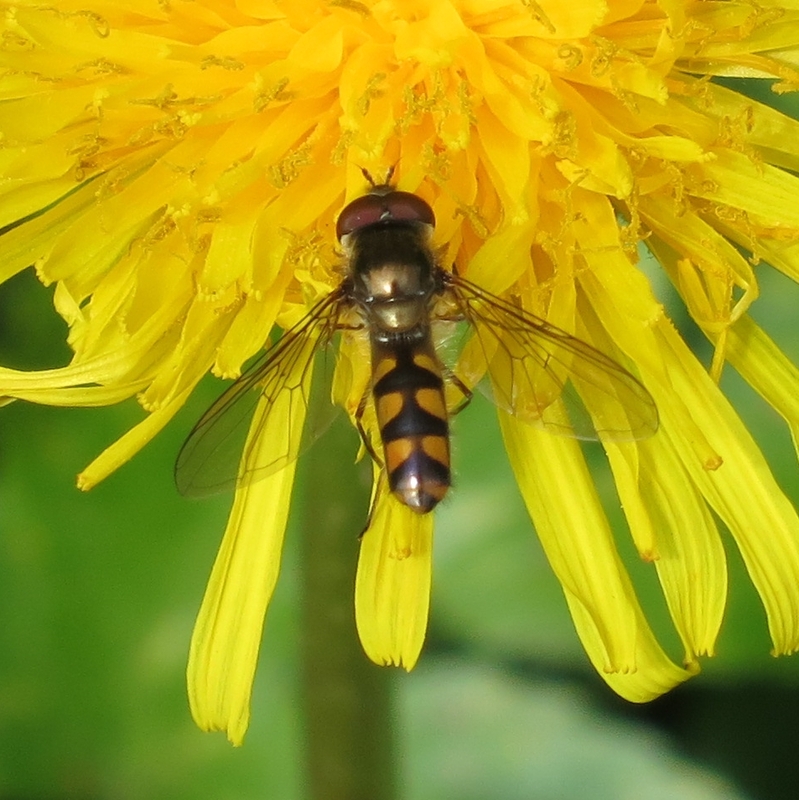 (Hover Fly? I'm never sure whether to stick the hover with the fly or leave them apart.) Well, for one things, there's something profoundly different between an individual and a crowd. And for another, it looked a bit like a bumble bee. 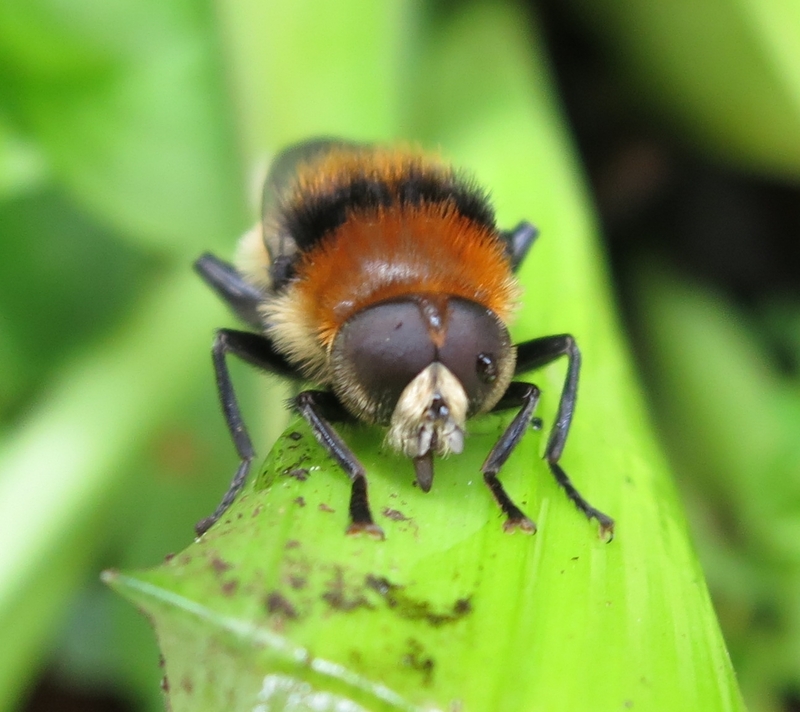 And for another - when I began this blog I thought a hover-fly is a hover fly is a hoverfly. When I found there are 270 identified species of hoverfly in Britain (*1) . . . I was . . . . . . gob-smacked! And when I began to peer at those around me with my camera (which I use as a microscope as well as a telescope and as a recorder of images) I was overwhelmed by the beauty in the variety of their colours. So - as you may have gathered - I have a bit of a soft spot for hoverflies. Ignoring the tea, I tipped a little sugar onto a saucer, added a little warm water, stirred it up and dripped the resulting syrup onto the leaf as a kind of rescue package. I had no idea, no idea whatsoever whether hoverflies drink sugar water . . . but it looked like a bee . . . so I treated it like a bee. After a while, I gently lifted it and took it to the apple tree and lowered it onto a blossom. It must have been recovering by then, I reckoned, because it immediately spurned that particular blossom, and chose another for itself. I didn't know if it would have any interest in apple-blossom-nectar . . . but a little sugar and a little sunshine was all I had to offer. I took it's picture and left it to its own devices. Next . . . look through google images . . . find a possible ID . . . upload the photo to iSpot and hope I was wrong. But I wasn't. This hoverfly had been sitting on a waning daffodil leaf. This hoverfly was a Narcissus Fly. This hoverfly was a Merodon equestris. This kind of hoverfly lays an egg in the crown of a daffodils. The grub burrows into the bulb, takes up residence and turns it to slush. End of plant! (*2) Oh. Bother. I thought hoverfly larvae eat aphids. Why do there have to be exceptions? For all that I've said how often people stop to talk when I'm taking photos, by fortunate chance rarely are they neighbours. But I'd started to take photos of this hover fly (Meliscaieva auricollis?) when a neighbour came down the hill. Just as she hoved a few feet away, a bee (honey bee? a bit too fast to tell) bomb dived the hoverfly and away they flew. "Oh, you've frightened it!" I exclaimed. Aloud. "Not you! You didn't frighten it! It was a bee!" 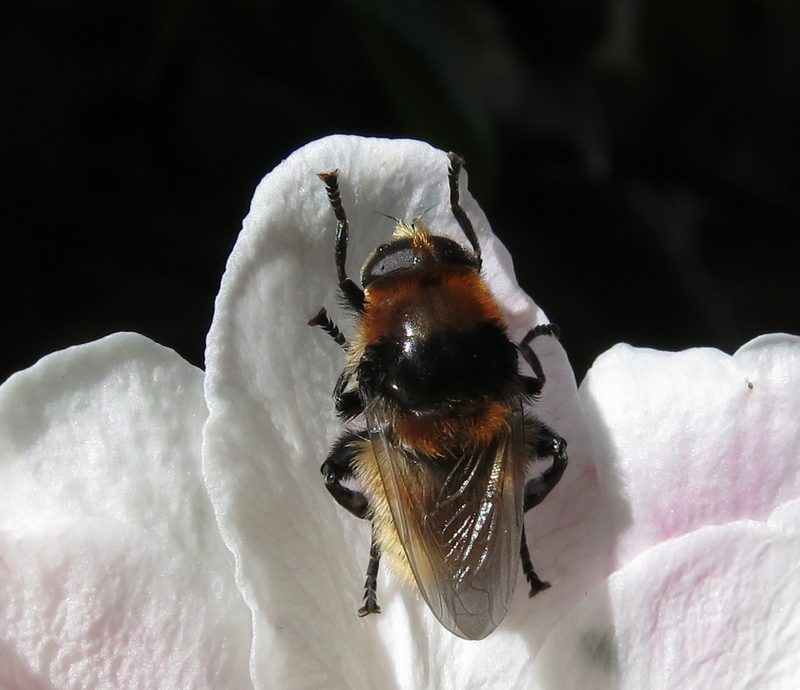 Then realising she might not understand, I explained about hoverflies as we walked on together . . . and how interesting they are . . . and that although I don't know why I'm interested in finding out which one is which kind . . . I just am . . . even if I forget straight away and have to go back to start every time I see a new one . . . and she seemed to think this was all perfectly acceptable. Phew! 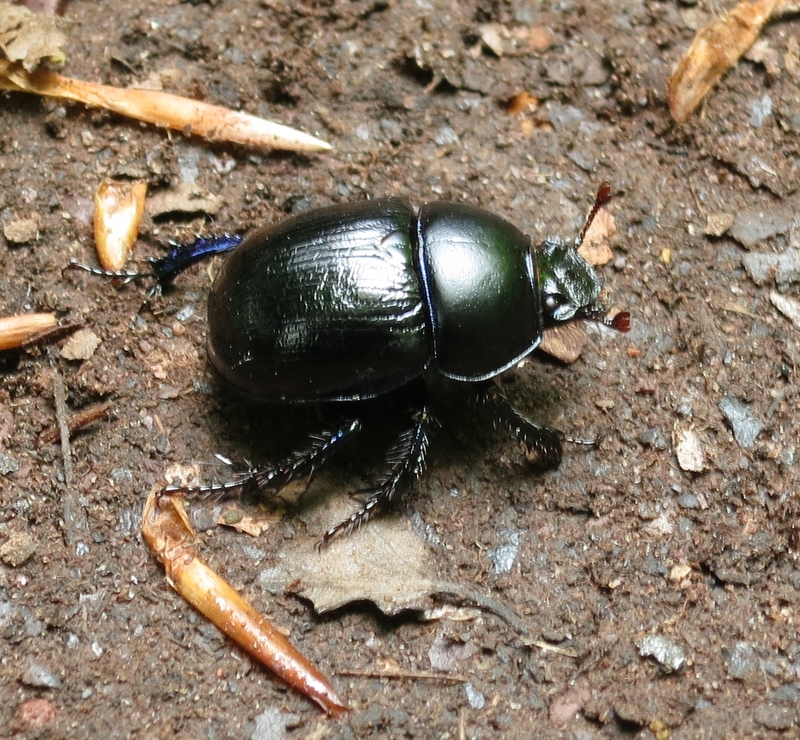 A Dor Beetle (Geotrupes) ? I found it walking along a path through a wood in Somerset. I photographed it from above, from its side and face on. Er. Where is its face? This, I decided, was a spooky monster! Where are its eyes? Internet to the rescue . . . to the bizarre . . . to the wonderful. That some beetles have eyes on the tops of their heads so they can see what's above them as well as where they're going. And, thence . . . to beetles with hats on. 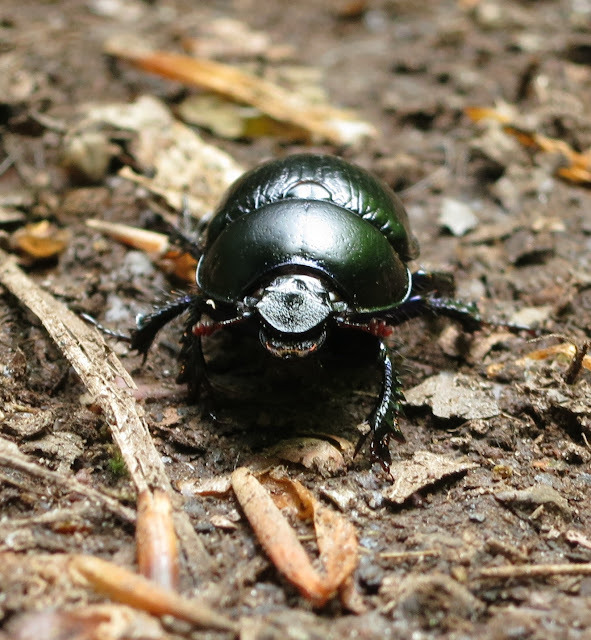 Scientists in South Africa have demonstrated that dung beetles, needing to make a fast get-away with their haul of dung (with a possible wife thrown in) can use the Milky Way as a guide when working out the most direct route from pile to burrow. They aren't interested in stars - just that bright straight line overhead. To check this out, the scientists made little hats for the beetles. Some were clear. Some were dark. The beetles with clear hats could walk in straight lines. Those with darkened ones couldn't. I doubt their counterparts in English woodland would have any chance of walking in a straight line over twigs and under leaves - let alone see the Milky Way through branches and clouds . . . but if you find the idea of beetles in hats appealing - you can read all about them here. Will you be posting about insects in the next few weeks? If so, let me know and I'll put the links here. 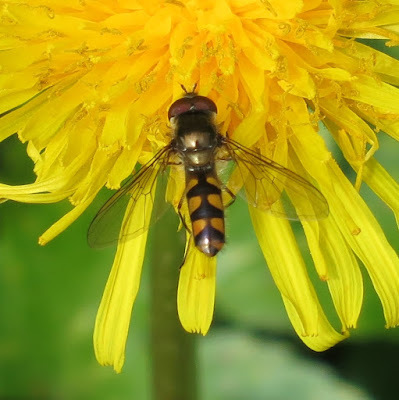 ALL ABOUT HOVERFLIES - Including diagram of body parts. This is on the Microscopy site - which includes a 'POND LIFE IDENTIFICATION KIT'. MIRODON EQUESTRIS (NARCISSUS BULB FLY) - On Pacific Bulb Society site. NATURE PHOTOGRAPHY - DRAGISA SAVIC (Serbia) - Large collection of clear photographs with IDs - flora, fauna, fungi of the kind you may not find elsewhere. 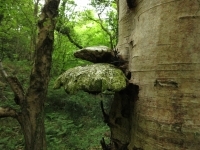 A good place for rusts and lichens. Take time for an eye-opening browse. IAN BEAVIS ON FLICKR - Photo Gallery with IDs of insects, amphibians etc. 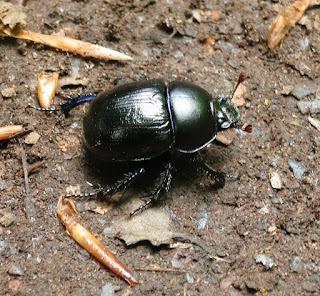 . .
What an interesting post, I must say that I rather like the idea of beetles with hats on:) Like you I'm rather fond of hoverflies and have always considered them to be good guys, obviously there are exceptions to the rule! I am quite disillusioned to learn abut the daffodil killing overfly! Like you, I thought they were all beneficial souls and have a soft spot for them. I`ll try to find some insects to photograph over the next few weeks. Hello Rowan. There's a serious and interesting purpose to the research but (I don't know whether you followed the link) but they look rather charming in their pointed bonnets! Hello Philip. Definitely counts. I've put the link on the post. Hello Jack. So pleased you like the post - and the style! It's encouraging. Thanks for visiting my blogpost, i was directed here. I love your interest for insects specially hoverflies. I am interested in hoyas and there's a lot of insects that i wonder if there are hoverflies, i even don't know if we have them here, all i know is we have flies. I will be reading lots of your insect posts. I also have lots of them and butterflies because they are nice to photograph. Regarding your comment in my post, that i seem to circumvent the rules in my condominium building, that is the beauty of my circumstances. And don't worry i don't have pots that might fall, i only have transient little things on top of the airconditioner. Thanks Al. I'm pleased that you like the photos. Hello Andrea. I think from reading your blog that you are a real plant expert! I look forward to you visiting again. Not all my posts are about insects but because I pay a lot of attention to wild plants, they cannot fail to make appearances from time to time. I know about none of these things! I do know that you take great photos and your macros are really good. There now, you have taught me something new - about the Daffodil killing hoverfly! Magic.